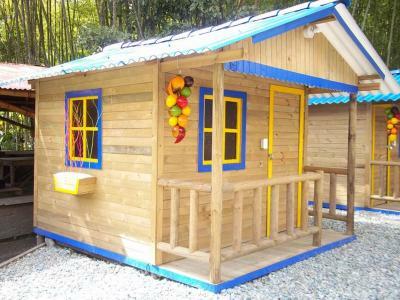 Lock in a great price for Cabañas Finca Villa Natalia – rated 8.5 by recent guests! We stayed at the finca for three nights. As it is a bit remoted they picked us up in Boquía! 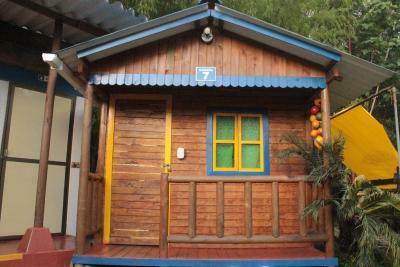 It is the ideal place for those who want to spend the day in Salento and its surroundings and sleep in the nature. 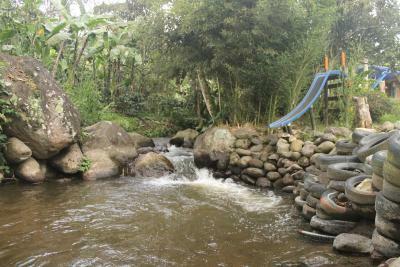 Beautiful location, close to the river, many birds and green. 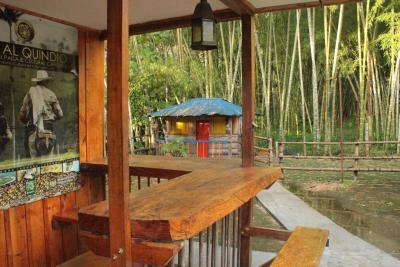 Very nice place, located in the valley next to Salento in Boquia. Surrounded by two rivers and lots of beautiful landscapes. The hosts are very nice and they even pick you up from the bus station of boquia. Otherwise it is a 20 min walk along the river to get to the station. It has a basic open air kitchen and a fridge, good for the people who stay in the small but lovely cabañas like we did. Internet worked mostly good . 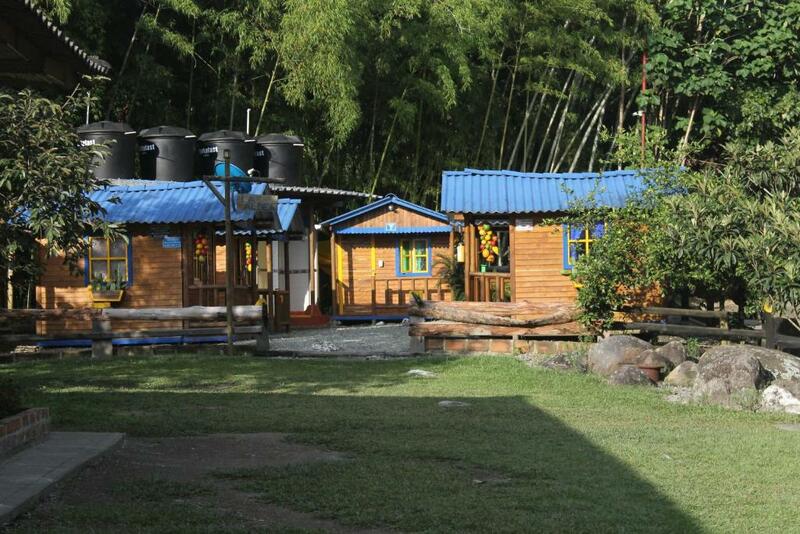 It is a perfect place to stay if you like the nature and silence. It’s very safe there, lot’s of cameras and most of the time the police hangs out there and enjoy the garden or play domino with Natalia :). Perfect place for children!! Camping also available. Natalia has a well equipped shop with basic food, sweets, drinks, cigarettes... We really enjoyed staying there and you can easily do all the tours from there. The staff was very friendly and extremely helpfull! When the restaurant next door was closed Natalia drove us to the nearest place to get some food. The locatioan along the river and in the middle of nature was perfect. Bicycle rent was 200 metres from villa Natalia, so lots of bikini and biking oppertunities! Cute hut and campfire every night. Las cabañas, la naturaleza que la rodea, la atención y la limpieza. 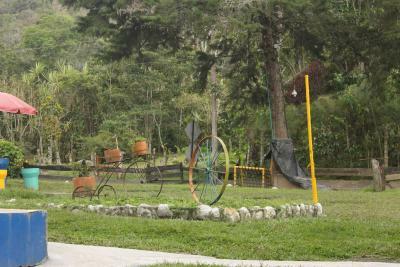 Located in Salento, Cabañas Finca Villa Natalia has accommodations with free WiFi. Some units include a seating area and/or a balcony. The lodge has an outdoor pool. 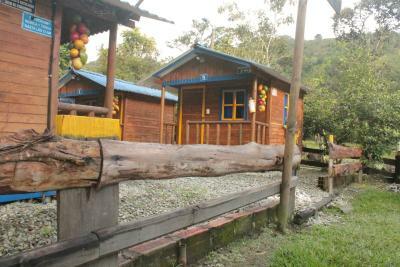 Santa Rosa de Cabal is 29 miles from Cabañas Finca Villa Natalia, while Pereira is 21 miles from the property. The nearest airport is El Edén International Airport, 23 miles from the property. 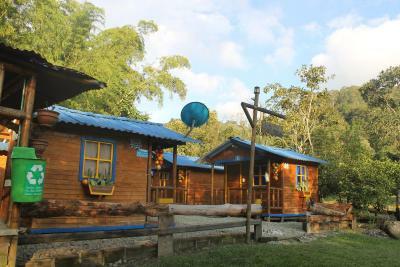 When would you like to stay at Cabañas Finca Villa Natalia? House Rules Cabañas Finca Villa Natalia takes special requests – add in the next step! Cabañas Finca Villa Natalia accepts these cards and reserves the right to temporarily hold an amount prior to arrival. Please inform Cabañas Finca Villa Natalia of your expected arrival time in advance. You can use the Special Requests box when booking, or contact the property directly using the contact details in your confirmation. It's quiet hard to get there. We had to carry our huge backpacks for more then half an our to get there and there is no public transport for that part. The rooms are quiet small as well so there is not a lot of room to put your stuff. Don't expect a fully equipped kitchen, even if you can find such pictures on google. And since the nearest Restaurant in Boquía is within 20 minutes walking-distance you might want to cook. When reading the reviews, staff is supposed to be fantastic. We did experience it differently. Maybe thats due to the fact that the owners were not there during our stay. Also they make you think on Booking that its nearly fully booked, but we were mostly the only guests at the finca during this time. Owners did not tell me that they were 2 kilometers off the main road with no taxi service and that I should call them to come and get me. I was dropped off by bus, in the dark, and without the help of a lovely young man would have been quite upset. The Internet was not working so I couldn't make arrangements for the next day which screwed up plans. TV didn't work either. Bathroom set up was all outside kind of like camping. Bed was hard as a rock and it was really cold with insufficient bedding so I froze all night and barely slept. Left very unhappy Would not go back. Hard to get to, you will need a 25.000 pesos taxi to get there at night. Noisy! On Saturday night the music from the neighbors was all night long! We didn't like the breakfast. We missed some equipment in the kitchen. Wifi didn't work all the time. The cold shower sometimes was very refreshing sometimes a little chilly.